If you would like to purchase bulk orders for your clients at a discounted rate, please use drop down menu to select the amount, and use the buy now button below. You may be divorcing, divorced, never married, a grandparent, or other relative of a child growing up between two homes. For whatever reason you find yourself in the situation of helping a child grow up between two homes, you may be wondering how to do so. Between Two Homes has the answers. 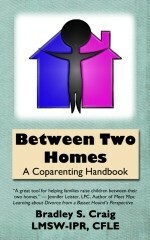 In this book, you’ll learn how to remain or become coparents (instead of opponents) and how to help your child grow and thrive while living between two homes. This book is also a helpful resource for mental health professionals and family law professionals. Not only does it provide helpful tools to help families, but it is a valuable text to provide to your clients.